Blitz Cooling Performer - Dezod Motorsports Inc - Home of the automotive performance enthusiast since 2002. 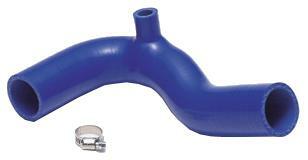 The Blitz Cooling Performers were designed to replace the factory radiator hoses for specific vehicle applications. Made from high-quality Silicone, the Blitz Cooling Performers are able to withstand extreme heat conditions and high pressure whilst providing an additional tap to make any installation of a Temperature gauge simple. Blitz Cooling Performer Kits include all necessary hardware, plugs, and clamps.